Metal Gear Solid V: The Phantom Pain Trailer Leaks Early - Tough to Watch? Well, Metal Gear Solid creator Hideo Kojima promised a trailer that would be difficult to watch, so here is Big Boss with his face totally drenched in blood. Metal Gear Solid V: The Phantom Pain is promising to bring a whole new dark tone to the series, which has always had some dark themes of government conspiracies, but with more of a fun action movie vibe. Not five seconds into this trailer do we see a field burning corpses and a vulture feeding off the remains of a roasted human. Thanks, Kojima. What else do we see? Boss murders a child. He gets a piece of shrapnel lodged in his head. He rubs the ashes of a dead comrade on his face. Fire and explosions rips through human beings like hot knives. Wayward soldiers brawl on a massive sea complex, cheering each other on like it could be an everyay bar fight. If Kojima is looking to portray a war torn world of grief and chaos then he certainly has the images he's looking for if he wants to turn a few heads. Again, shocking, but nothing nearly as unforgettable as Snake putting a pistol in his mouth in the Metal Gear Solid 4 reveal. 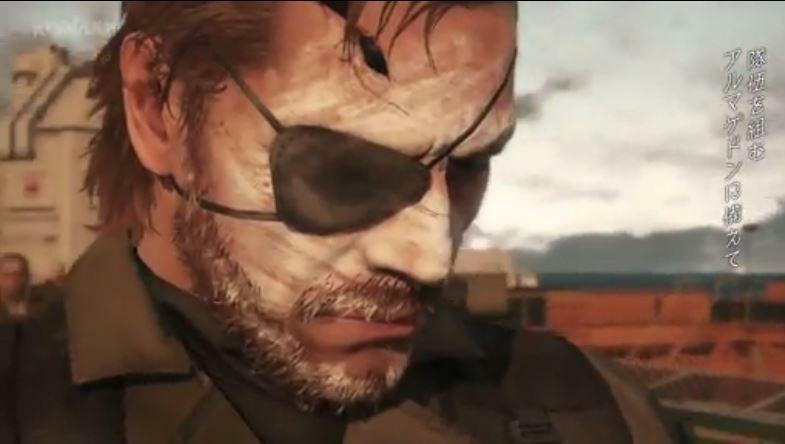 Throughout the trailer, Big Boss and his partner, Kazuhira Miller, are forming a group of soldiers called the "Diamond Dogs," which could very well be the foundation of what will become Outer Heaven, the renegade nation he forms at the beginning of the very first Metal Gear game. As much as I dislike the "serious" new tone, this is a very important chapter in the Metal Gear timeline as we are quickly approaching the point in time when Big Boss turns traitor to America. Metal Gear Solid V: The Phantom Pain could very well be portraying the events which push him over the edge and lead to his downfall. If Metal Gear Solid 4 was so important for wrapping up the timeline, then this is equally important for bringing it full circle. We can only hope that Hideo Kojima doesn't let his ambition and new love of gore get in the way of his storytelling and that he can find it within himself to just let this story come out naturally. I'm hoping Metal Gear Solid V: The Phantom Pain is a great game, probably more so than any other game at E3 this year. I don't know if it will be the last game, but I'm hoping it is. I really don't need to see a cracking voice Solid Snake go through a life changing mission at the peak of his adolescence. Ugh, could you imagine? Metal Gear Solid V: The Phantom Pain will be released for the PlayStation 3, PlayStation 4, Xbox 360 and Xbox One.